Digital forensic comprises integration of computer science with laws that are needed for the purpose of investigation of crime. It comprises complete recovery and then interpretation of data that is present in various digital devices to be presented in the courts of law and mostly involves various cyber crimes. Investigation in digital forensics is carried out in three different stages which include display acquisition, investigation and analysis together with reporting of crime. A few of the crucial companies in the digital forensics market comprise LogRhythm Inc., IBM Corporation, Paraben Corporation, AccessData Group LLC, FireEye Inc., Micro Systemation, Binary Intelligence LLC, Guidance Software Inc., CISCO, and AB, NUIX amongst many others. In accordance with the research report on the world market for Digital Forensics by Transparency Market Research (TMR), it has been anticipated that strong growth would prevail in the said market. 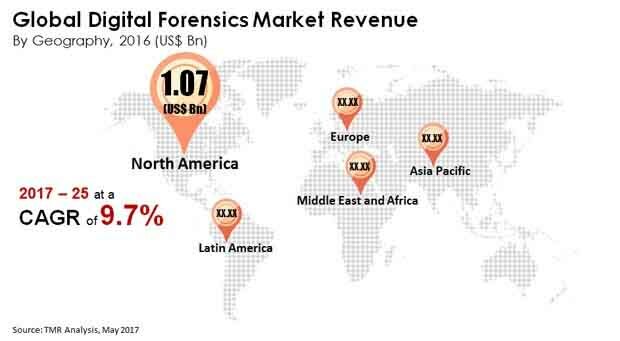 The world market for digital forensics market stood at a valuation of around US$ 2.87 bn in the year 2016 and is estimated to be worth around US$ 6.65 bn by the year 2025, thereby rising at a CAGR of 9.7% from 2017 and 2025. The world market for digital forensics has been regionally segmented into the geographies of South America, North America, Asia Pacific, Middle East and Africa, and Europe. The region of North America is quite likely to continue with market dominance in the international market for digital forensics. North America is expected to be trailed by Europe as it stood as a major regional segment of the said market. Asia Pacific accounts for a substantial revenue in the world market for digital forensics. The growing trend of internet of things technology and cloud based solutions in many of these regions is acting as the major growth driver in these geographies. Owing to the rampant growth of cloud devices and services with in-built facilities of Internet-of-Things, cyber criminals have undue advantage of dealing with leaking of customer information. Such characteristics might augment the risk of viruses and malwares thereby making computer systems prone to hacking. Another reason for the upsurge of the said market is the possible tracing of hacking activities to their source. These activities are traced by forensic agencies by making use of the right forensic methods. Thus, such evidence-based investigation for the purpose of recovery of information has been a prime factor for the rise of the market for digital forensics. The rise in demand for digital solutions and forensics tools is also fueled owing to the fact that multiple channels are utilized for the purpose of hacking confidential information from various organizations and companies.